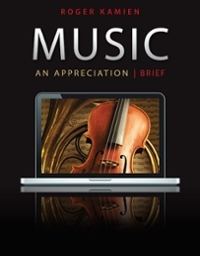 Music: An Appreciation Brief Edition with 5-CD Set 7 Edition Whether from a concert stage or in front of a classroom, Roger Kamien knows how to connect with an audience. It is his unique combination of a performer's musical sensibility and a teacher's understanding of what works with students that has made that has made the Brief Edition of Music: An Appreciation the most widely-used text of its kind. The book's impeccable scholarship, clear presentation of musical elements and history, carefully chosen repertoire of musical selections, and insightful listening guides have been its hallmarks from the first edition.